Bookman had such a great time that he asked me to come up with another “destination ride” for July. I have given him a couple options. One is ice cream, another is a picnic and coffee and a baked treat or ice cream, and a third is a vegan deli lunch. He’s thinking about it. July 15th is when the ride is likely to take place. We’ll see where his stomach leads him. The serviceberries are ripe and I have been enjoying those in my yogurt. I started picking cherries from the tree today. And the first couple of ripe raspberries. We seem to have an endless supply of arugula. Later this week the first radishes should be ready to pull. The potatoes are starting to flower and I’ve got them mounded up with dirt and straw. Grow taters, grow! 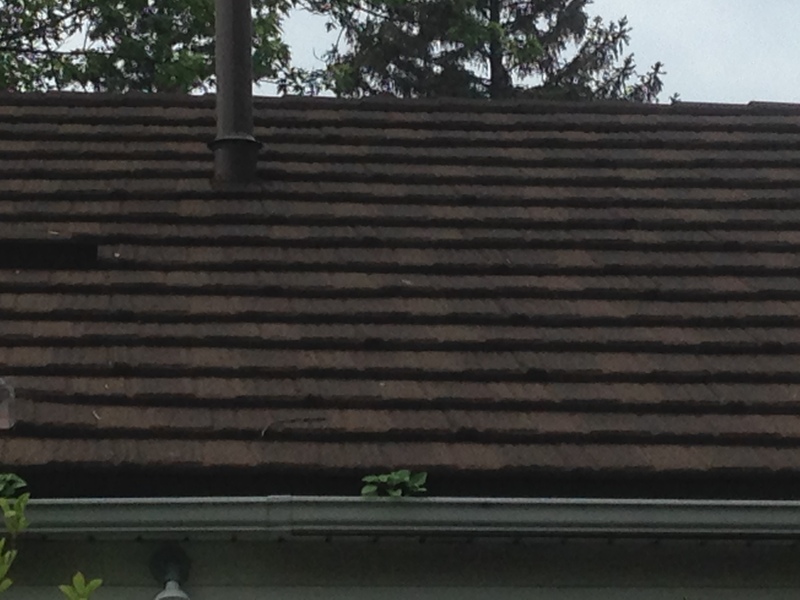 And I neglected to mention a few weeks ago, we got a new roof on our house. We went for steel “shake” shingles. It will last longer than me or the house and we got a discount on our homeowner’s insurance because of it. I have also read some really good books which I hope to tell you about in the coming days. Your posts are making me hungry! I do not think that I ever had serviceberries. I must try them., I love your ideas for destination rides. Brian Joseph, I was getting hungry while writing it! Serviceberries, also called Juneberries are delicious. They don’t have seeds, have a mellow sweet flavor and can be eaten fresh off the bush or made into jams or baked or frozen. I love destination rides even when they don’t involve food! BookerTalk, it was a house-made version of nutella since the store-bought version is not vegan. What a shame the official version has hydrogenated fat! Hopefully since more and more companies are moving away from it, they will too. I like the sound of your home made version. How do you make it?? Well I didn’t make it, the crepe shop did. Theirs is basically hazelnut butter and cocoa instead of chocolate. 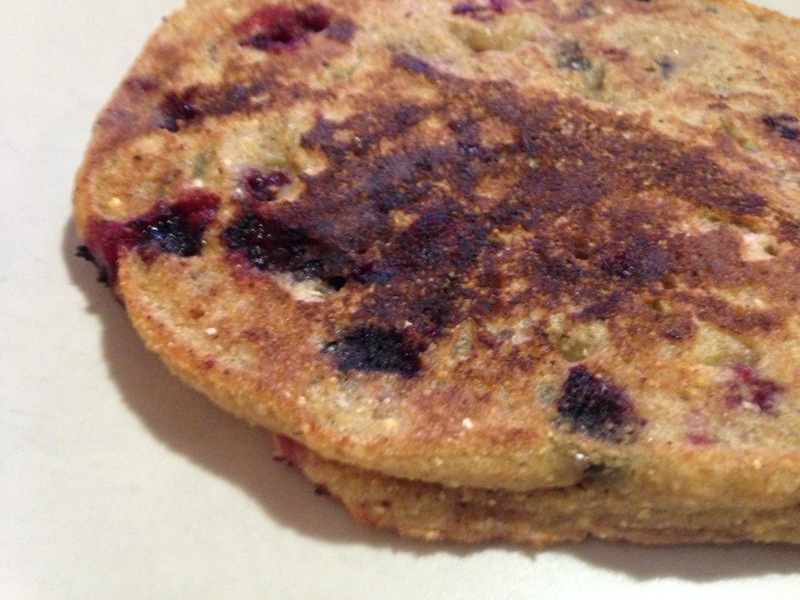 The destination rides sound like fun, especially with food as the goal. I wish we lived close enough for me to take some of that arugula off your hands. I love arugula! Joan, there are a couple new-ish farm animal sanctuaries that I’d like to turn into a destination ride sometime but they are too long of a ride for Bookman. I love arugula and can’t have too much but I would share it with you! This post is making me hungry! 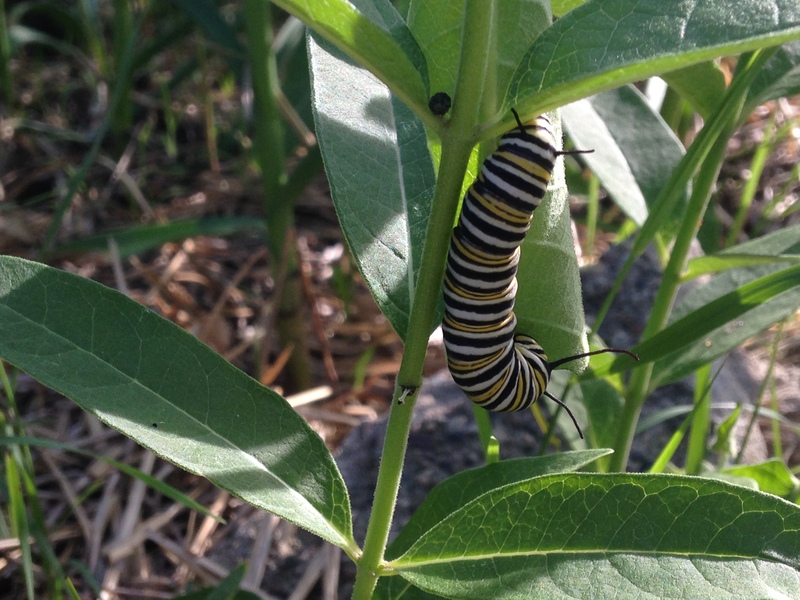 I love seeing that Monarch caterpillar! Laila, LOL I sometimes joke that I bike so much so I can eat more 🙂 I was so happy about the caterpillar and it was a big fat one too! I hope it found a safe place to make its chrysalis. 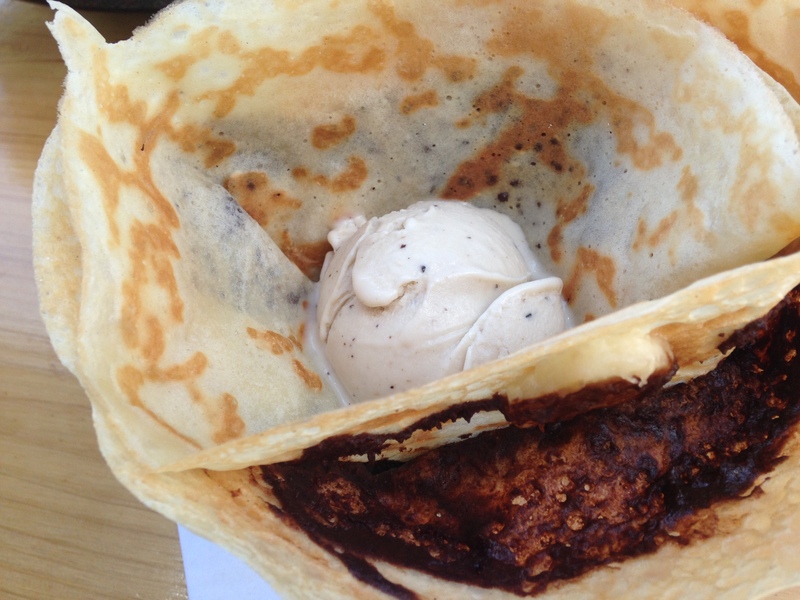 Ohhhh…..banana and nutella in crepes….YUMMMM! Destination rides with a good meal at then end…..that’s an awesome deal!!! Now that makes signing up for a long bike ride worth it!